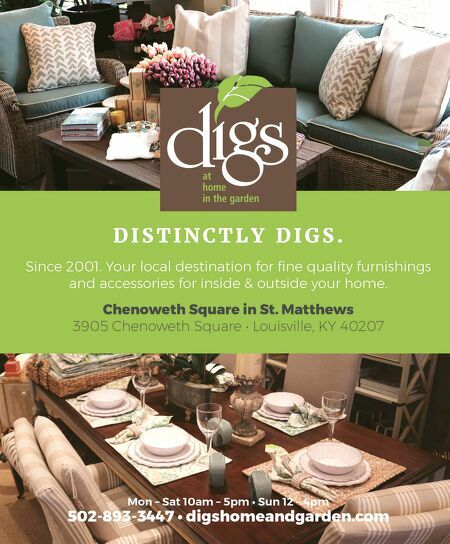 54 LOUISVILLE MAGAZINE 5.18 Special Advertising Section Louisville Tile Distributors has offered the latest trends in ceramic, porcelain, stone, glass and metal tile to the Kentucky, Indiana, Ohio and Tennessee markets for over 60 years and continues to grow. They have been recognized as one of Louisville's 50 fastest-growing private companies. What's more, for three years in a row, they've been voted one of Kentucky's best places to work. Louisville Tile focuses on offering their customers the latest trends in tile along with the best possible customer service. According to Amy Balsimo, Showroom Design Director at Louisville Tile, gray and white tiles remain highly popular. She is seeing warmer tones slowly emerge along with some color, mostly blue. "Blue has made a comeback in the last year. Anything from navy to robin's egg blue is popping up everywhere. We are also seeing interesting shapes and dimensions with hexagon being the most popular," Amy reports. Wall tile remains on the radar with large, small and dimensional rectangular shapes still trending. Check out these latest trends and their inventory of go- to traditional styles at Louisville Tile's brand new showroom at Westport Village. Thinking about adding value to your home by refreshing your kitchen? For as little as $5 per square foot or less, Louisville Tile can make your dream a reality. Visit louisville-tile.com or schedule an appointment at the new Westport Village showroom, (502) 426-3991, or the Bishop Lane showroom location, (502) 452-2037. Appointments are encouraged and can be also be scheduled online through the website. 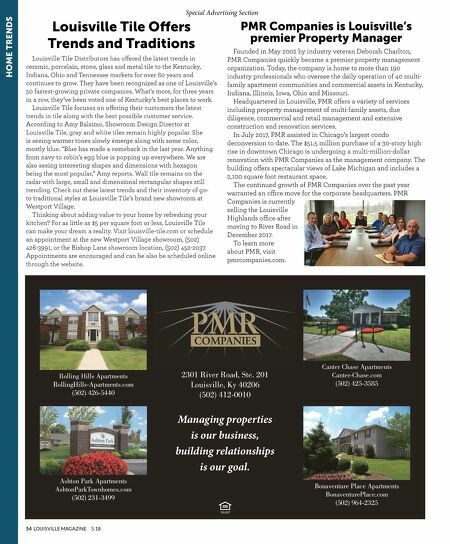 Founded in May 2002 by industry veteran Deborah Charlton, PMR Companies quickly became a premier property management organization. Today, the company is home to more than 190 industry professionals who oversee the daily operation of 40 multi- family apartment communities and commercial assets in Kentucky, Indiana, Illinois, Iowa, Ohio and Missouri. Headquartered in Louisville, PMR offers a variety of services including property management of multi-family assets, due diligence, commercial and retail management and extensive construction and renovation services. In July 2017, PMR assisted in Chicago's largest condo deconversion to date. The $51.5 million purchase of a 30-story high rise in downtown Chicago is undergoing a multi-million-dollar renovation with PMR Companies as the management company. The building offers spectacular views of Lake Michigan and includes a 2,100 square foot restaurant space. The continued growth of PMR Companies over the past year warranted an office move for the corporate headquarters. PMR Companies is currently selling the Louisville Highlands office after moving to River Road in December 2017. To learn more about PMR, visit pmrcompanies.com. Louisville Tile Offers Trends and Traditions PMR Companies is Louisville's premier Property Manager HOME TRENDS Rolling Hills Apartments RollingHills-Apartments.com (502) 426-5440 Ashton Park Apartments AshtonParkTownhomes.com (502) 231-3499 Canter Chase Apartments Canter-Chase.com (502) 425-3585 Bonaventure Place Apartments BonaventurePlace.com (502) 964-2325 2301 River Road, Ste. 201 Louisville, Ky 40206 (502) 412-0010 Managing properties is our business, building relationships is our goal.